When my oldest daughter was about six months old, we were visiting my parents in Seattle for Christmas. I had just fed her and was walking down the stairs when she released the entire contents of her stomach in a most violent manner. Thereafter, she got a red rash all over her body. We took her to a doctor and found out she had had an allergic reaction to my milk. This had never happened before. I knew there must have been something I had eaten that had caused this. I racked my brain, trying to think of what I had eaten the day before that may have caused such a terrible assault on my poor baby’s body. Then I remembered the five pistachios. When we returned home to Denver, we took her to an allergist. They tested her for everything under the sun, and sure enough, pistachios were at the top of the list for “most allergic” items. We discovered that she was allergic to all tree nuts, peanuts, wheat, eggs, milk, and a bunch of other random things like cucumbers and coconuts. I hope you do not suffer from the same affliction as my daughter, because then you would not be able to have this delectable ice cream. Forget the fake green stuff with made-up pistachio flavor. 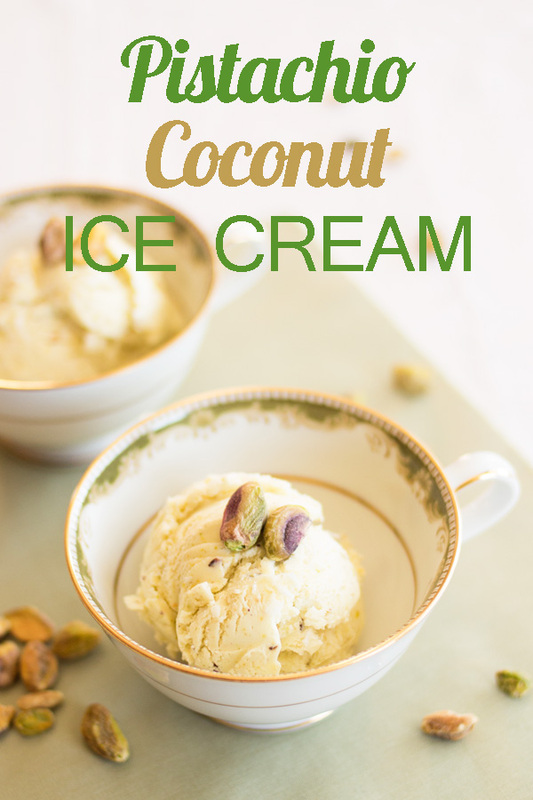 This ice cream is the real deal, made with coconut oil and ground pistachios. The flavor and color are delicate and classy. Like something you would see on Downton Abbey. Coconut Oil is considered a “super food,” and is beneficial to almost every part of the body including the skin, hair, digestive system, bones, and immune system. It fights off fungi, bacteria, and viruses. (See Health Benefits of Coconut Oil). Pistachios aid in digestion and weight management. They also increase iron absorption and are heart-healthy. (See Health Benefits of Pistachios). Put the melted coconut oil, 1/2 cup shelled pistachios, and 1/2 cup of the milk in a blender and blend well. You can leave the pistachios a little chunky if you want, or try to blend them so they are very fine. Pour into a large bowl and add the other 1/2 cup of milk and sugar. Stir with a wire whisk until the sugar is dissolved. Add the 2 cups of cream and stir well. Add to your ice cream maker and follow the manufacturer's directions. 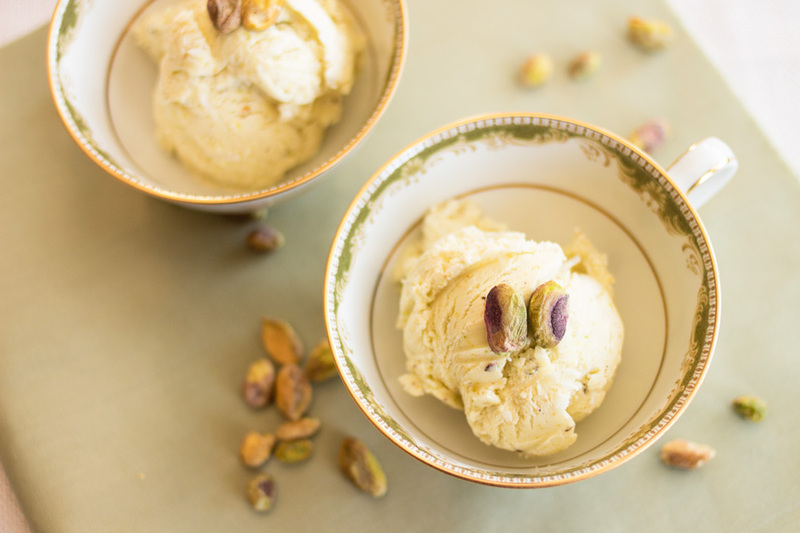 Just before turning off the ice cream maker, you can add about 1/2 cup shredded coconut and 1/2 cup chopped pistachios if desired. Transfer to an airtight container and freeze for several hours or overnight. Please share this on Pinterest! Just click the “Pin it” button on the picture below! I remember that experience of Julianna getting sick after you ate some nuts. It’s amazing she’s as healthy and vibrant as she is with all here allergies. Oh I’m sure thankful I don’t have an allergy to pistachio because this ice cream just looks TOO good Melissa!